This heart is approx. 1 inch and made of sturdy sterling silver. On top is a 1/2" gold-filled round disc, topped off with a sterling silver puffy heart. 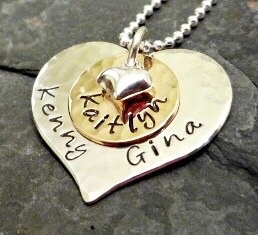 Put the names of your children, grandchildren, or hubby and wife on the heart and little one on the gold-filled circle. Email me with questions you may have about creating your special pendant.